It all began with Bapak, and he was not only the channel for the latihan, he also explained it. And he outlined a grand vision, the mission of Subud in the world. We live in extraordinary times with the pace of change ever accelerating, especially in the field of science, technology and communication. Our minds are sometimes overwhelmed, and it becomes more and more difficult to be connected to one’s Essential Self and through that to All that exists, or as some put it God, Allah, Brahma or whatever language tries to express the inexpressible. As an adolescent and young man, I could only dimly remember that connection, I say dimly because I had mostly forgotten it and believed in my conscious reasoning mind that it did not exist. However deep within me, perhaps in my subconscious Inner feeling, was a longing for that connection to come alive again. 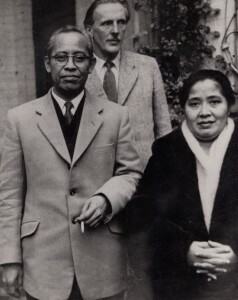 The coming of Bapak to Coombe Springs in June 1957 was heralded for me six weeks earlier by an experience which woke me in the middle of the night, and which I now recognise as my Opening to the Love and Power of the Almighty. I was suddenly very wide-awake and became aware of a ball of bright light above the French doors in front of me. It moved first into my head and then filled the whole of my body. It was accompanied by an intense blissful happiness and a feeling of being in my real home. My heart felt itself expanding but it knew it could not expand enough to contain it all. I heard my own voice telling me to follow what the Man from the East had to bring. A few days later walking along a path I found myself leaping in the air saying “ Eureka, I have a soul”. I began to be happy. One reason for this was the healing of the grief over my father’s death 11 years earlier. I experienced him sitting beside me sharing my happiness while on a train in the London underground. That a human being can have a set of experiences which includes hardly sleeping for a thousand days while he is taught about the structure of Man’s being, has an Ascension and is given the task to open Mankind to the Love Power and Guidance of the Almighty is already a miracle many times over. That this experience can be handed to others who need it through, what we call the Opening (a most revealing word) is another extraordinary miracle. His hopes for us all were expressed in a few simple words “ All you need to do now is to put it into practice” and “ Everything that you need is there from A to Z” “ The latihan is a continual learning from your Inner Self”. I confess that there have been many times when I feel that I have disappointed his hopes for us and me in particular through not being enough of an example of a true Subud person to attract people to the miracle of the latihan. Thinking and words always get in the way. But when this feeling comes to me I try to feel what I can do to meet the real need of someone in some way that is within my capacity. Because of how I was at that time of life and I guess how many of us were we regarded Bapak as something like the return of Jesus Christ, someone who knew and understood everything and who had power over events, such was the wonderful atmosphere of the miraculous around us. I certainly was in awe of him. He did his best to disabuse us over that and to say that he was only a channel for the Power of the Almighty. Later when he asked forgiveness at the end of a Ramadan and someone said that he did not need to ask us for forgiveness, he became quite stern and said he was a human being who made mistakes and again asked us for forgiveness. This was a great comfort to me later. BUT what we witnessed at Coombe was a man who walked and talked like no other we had yet met. When he walked there was a visible sense of Presence and Self Awareness. When he spoke about spiritual matters there was a sense that he was talking directly from his experience rather than talking learnedly about something. His words had the deep ring of truth and somehow made me quiet as they found their mark in my inner feeling. If I try to answer that question now I would say that I know I have the power of choice. To be miserable and complain about what I don’t have and this list is actually very small, or to be happy and be grateful for what I do have and this list is very long and top of it is what we call the latihan. I could go on about the proofs and I like many here have had many proofs. We need to remember them on this day that we thank the Almighty for the Gift of Bapak to this world and the Opening and the Contact that he brought to our own Inner Selves.